The Bible mentions in numerous verses that there are ‘spring of the deep,’ or springs of water at the bottoms of the ocean. The word for springs here in the Hebrew is NEBEK which literally means for waters to ‘issue’ or ‘burst fourth’! Job 38.16- “Have you journeyed to the springs of the sea or walked in the recesses of the deep? Psalms 33.6-9- He gathered the waters of the sea together as a heap: He layeth up the depth in storehouses. When God judged mankind in a catastrophic world flood he broke open these storehouses and flooded the entire world. Gen 7.11- on that day all the springs of the great deep burst forth, and the floodgates of the heavens were opened. Before the 1900’s little was known about the ocean flood according to modern science. 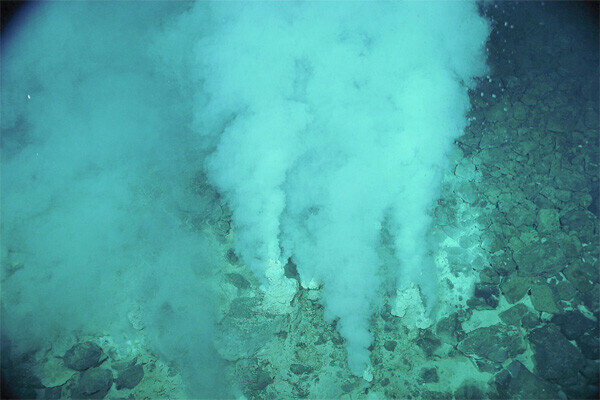 Undersea volcanoes known as sea mounts or guyots where observed to protrude from the ocean floors, and in the 1970’s the first discovery of an undersea vent or water spring was made. The Deep sea submarine known as Alvin allowed researchers to view and take pictures of these undersea vents. The heat from volcanic activity causes great amounts of pressure under the crust of the ocean, causing the water to escape through thinner parts of the ocean floors surface. Even though the majority of the ocean floor remains undiscovered, the parts of the mid-oceanic ridge system is commonly found to be inhabited with these underwater springs. It is highly suggested that water circulation through these ridges are a part of the geologic process. It is estimated that 40 cubit mi flow form these springs each year. No one in ancient time could have had any possible indication that there where springs of water that flowed from a lower source to the floor of the ocean. Even if someone in ancient times hypothesized from observing a similar phenomenon in shallow water, that waters at greater depths may have springs coming from a lower source, it in no way means that they were going to be correct. The fact that this has become a complete scientific fact in oceanography is the point that should be recognized.